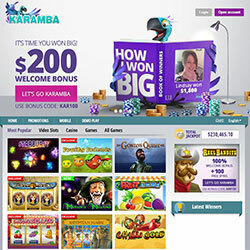 Karamba doesn’t consider itself an online casino, instead displaying the mantra “Slots ‘N Fun” proudly above their name. They’re probably onto something too, as their website borrows more from the modern social gaming revolution than the online casinos of old. You’re greeted by a very happy, very shiny home page that sets the tone for what is to come: more than 60 fun and engaging games. They are fun and engaging too, and Karamba have attracted 4 different developers to their games portal. On board are Net Entertainment, Neogames, Cryptologic and Amaya, combined to offer a range of up to the minute slots, table games, scratchcards, and bingo. Of course, being a modern site, Karamba has a great mobile casino, offering their casino games across a number of different platforms. There are applications available for the iPhone, iPad, Android devices, Blackberry and even for feature phones. They really do try to cater to everyone. With a huge amount of support available, and a frankly ludicrous number of banking options, Karamba really does stick to the Customers Are Really Everthing mantra they preach. This is one of the most modern, and most enjoyable online casinos out there. There are a few blackjack options to play at Karamba, with table games on offer from all three of their respected developers: NetEnt, Neogames, Cryptologic and Amaya. 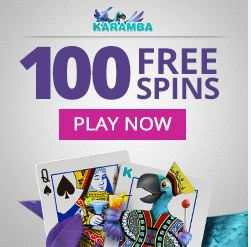 It’s slots that Karamba really focus on, though, with a great selection of modern games available, such as NetEnt’s Starburst, in which you can win both ways. 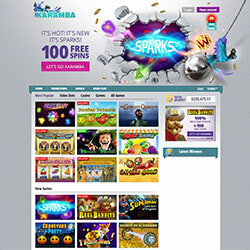 There are also scratchcards available, as well as other instant win games, as Karamba focus on that instant fun the social and mobile gamer loves. With their modern site, Karamba have a modern bonus to go with it. First up, you can collect a cool 100 free spins to enjoy on your favorite game, upon a fantastic 100% max $200 first deposit bonus really brightens your day. Karamba is definitely an online casino with a difference. Instead of the usual pictures of men draped in women and casino chips, their website is full of fun, bright, and energetic scenes from the top slot games in their library. You’ll enjoy every second of your time at Karamba. 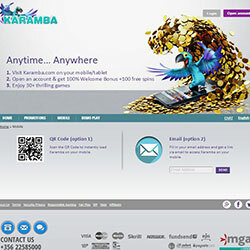 The mobile casino features at Karamba are extensive, with support given to Apple and Android devices, as well as Blackberrys and feature phones, too. With all this integration, they provide a great level of support, so you can be sure you can enjoy their Slots ‘N Fun experience wherever and whenever you want.